Rent Wisconsin Cabins is passionate about Wisconsin and the outdoors: hiking, biking, bird watching, snowmobiling, skiing, and of course fishing. It is important to us that everyone has the opportunity to enjoy all that nature has to offer, that is why we love the organization Fishing Has No Boundaries! “Most of us think that going fishing is as easy as a walk down to a lake. . . . . . For over 56 million Americans with disabilities, it’s just not that easy.” Fishing Has No Boundaries reaches out to people with disabilities, giving them the opportunity to enjoy fishing. Originating in Hayward, WI, this non-profit group has since expanded now reaches thousands of individuals in 11 states. For the past four years (5 years in January), Rent Wisconsin Cabins has been proudly supporting the organization. It’s our privilege to be part of the FHNB team who provides specialized equipment and gear to enhance the fishing experience for anglers with disabilities. Events are held from May to September each year. Volunteers, sponsors, and participants are encouraged to attend one of the many events. 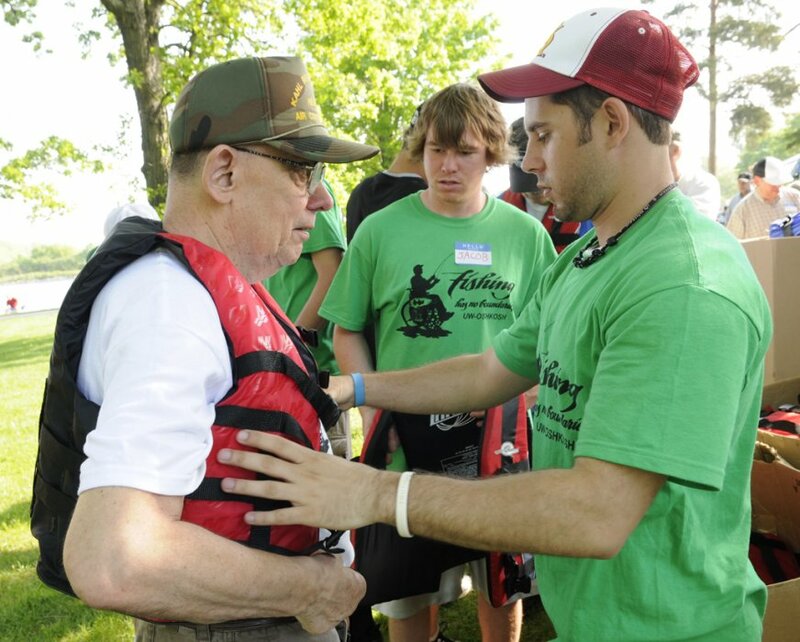 Duties of the volunteers can range from cooking, guiding, assassinating participants on/off watercraft, emergency medical care, fish cleaning, and more. Are you interested in becoming involved with this great organization? Refer to the Fishing Has No Boundaries website for further information and to find a chapter near you! This entry was posted in Updates and News, What to do in Wisconsin and tagged fishing, volunteer, wisconsin. Bookmark the permalink.